The censuses of 1901 and 1911 confirm that Thomas Dennis Lamb was born and raised in Bottesford. He was the youngest child of Tom Lamb, a joiner born about 1858 at Woolsthorpe-by-Belvoir. His mother was Eliza Lamb, born about 1857 in Bottesford. In 1901, the family lived at 10 Muston Road, Easthorpe, at which time there were six daughters and two sons, all born in Bottesford. The elder boy was Charles Lamb, born 1889, while Thomas was born in 1900. By the 1911 census the family had moved the short distance to 4 Muston Road, Easthorpe. A search of the General Register of Births, Marriages and Deaths (BMD) confirmed that he was born in the 1st quarter of 1900 in Grantham registration district, and that he died in the Melton Mowbray district in the 2nd quarter of 1932. The BMD also records, from the 4th quarter of 1929, that a man called Tom Lamb married Mary Oliver in the Grantham area: this may well be the Tom Lamb from Bottesford, but this is not certain (the record does not include the age or home address of the bridegroom). There is a headstone in the southern part of St Mary’s churchyard, Bottesford, for several members of the family: Charles son of Thomas and Eliza Lamb, 22nd June, 1913 aged 24; also Eliza, 15th April, 1929 aged 73; also Thomas Dennis Lamb, 21st April, 1932 aged 33; also Winifred 10th September, 1924 aged 26; also Edith 14th September, 1924 aged 37. A search of war service records located over 100 for men called Thomas Lamb, but none was shown to belong to the man from Bottesford. 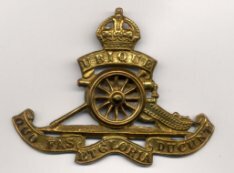 However, a repeat search located the Medal Index Card for a Thomas Dennis Lamb, who served as Driver 124460, Royal Field Artillery. This may be the man from Bottesford, whose second Christian name was Dennis. No additional information has been located thus far. Tom Lamb would have been only 15 years old in 1914, and probably did not join the RFA until 1917 when he would have been 18 (unless he enlisted under-age). Very few details of his service career have been found.